How does a client leave feedback for me? Previously, clients were only asked for feedback when they closed a project. Now, clients will be asked to provide feedback any time that they submit payment. This is what the workflow will look like. A client submits a payment successfully. This means they've paid via Credit Card or PayPal, or they've paid in a manual way and RecruitLoop has received and marked that payment as completed. 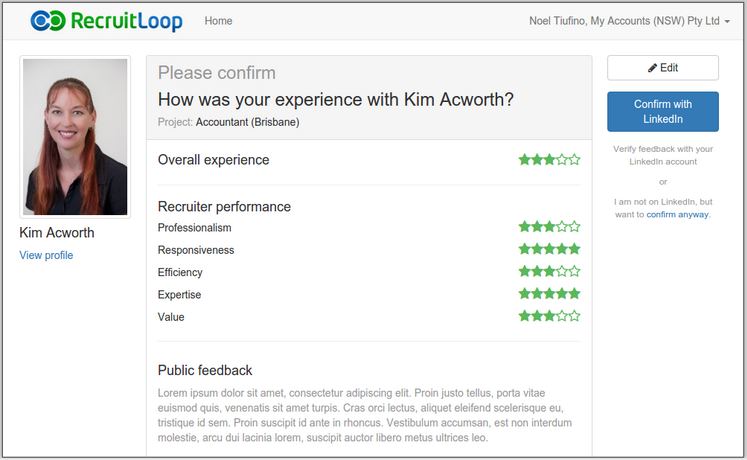 A client receives an email from RecruitLoop asking them for feedback. 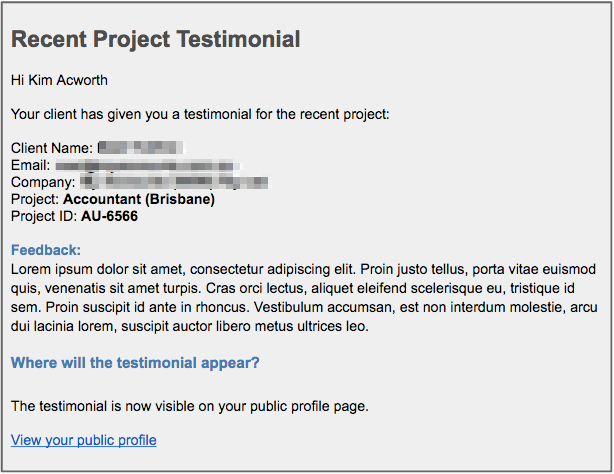 The client will get the email within 30 minutes of paying their invoice. If they don't action the feedback request, we'll email them again after 2 days, and 7 days. Client clicks the link to leave feedback and is taken to a page where they see the recruiter and are asked to rate the recruiter and RecruitLoop on a few different metrics. Client must answer all ratings questions before they can click "Next". Client clicks " next" and sees a second page, where they can share both public and private feedback. 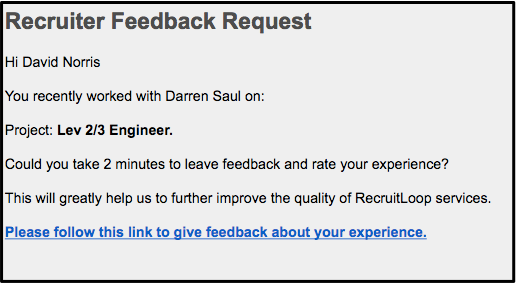 The public feedback will appear on the recruiter's profile. 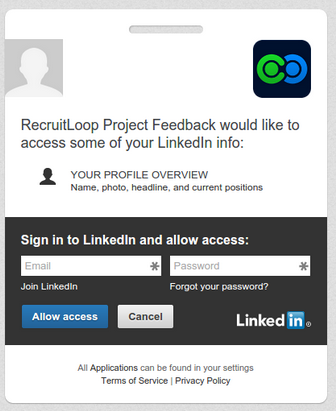 The anonymous, private feedback will not appear on the recruiter profile and will be sent to the RecruitLoop team. After the client has completed writing their feedback, they click "submit" and are taken a third page where they can confirm what they've said before it's officially submitted. They're asked to " Confirm with LinkedIn", which means that their review on the recruiter profile has been verified by LinkedIn. If they do not have a LinkedIn account, they can still confirm, by following the instructions and clicking on the designated button. After clicking "Confirm with LinkedIn", the client will be asked to sign in to their LinkedIn account in order to verify the review. 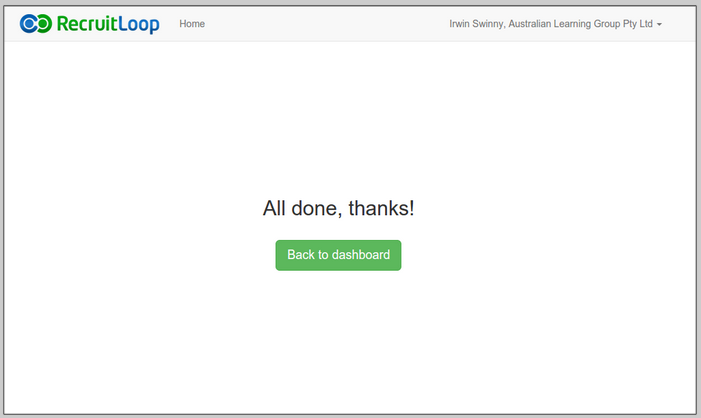 After verifying, they're taken back to the RecruitLoop platform. The recruiter who was reviewed will receive an email about their review.